The combined powers of three of NASA's Great Observatories -- the Hubble Space Telescope, the Chandra X-ray Observatory, and the Spitzer Space Telescope -- have been used to find evidence of a hidden population of supermassive black holes in the universe. All these space telescopes took a long look at a small region of the sky (called the Great Observatories Origins Deep Survey field, or the GOODS field for short). 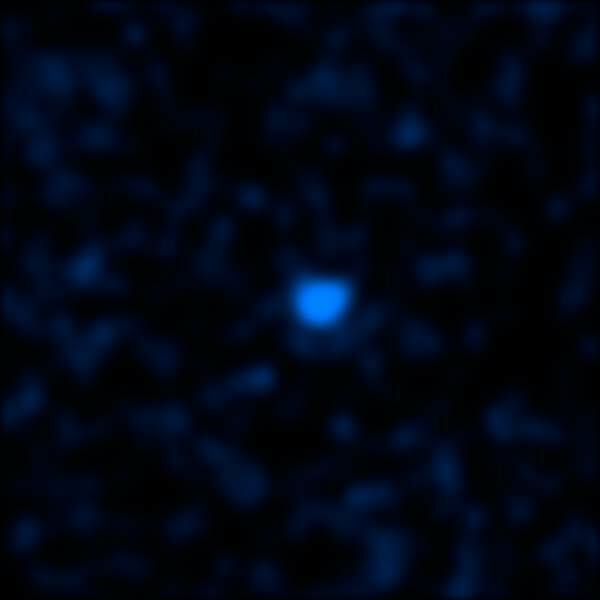 When visible light and X-ray light from this region were compared, astronomers found numerous X-ray sources that can be identified as supermassive black holes in young galaxies billions of light years from Earth. But the X-ray glow from other sources had no obvious host galaxies in optical light. 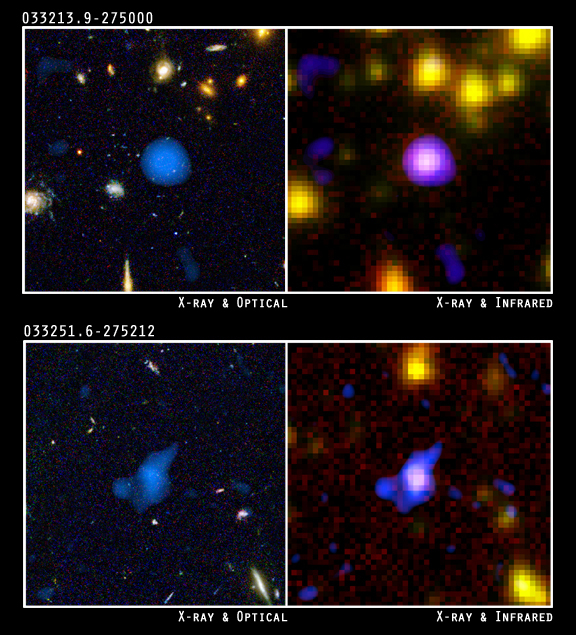 Two of these X-ray sources are identified by the central blue spots in the composite Hubble-Chandra images on the upper and lower left panels. The Chandra-Spitzer composite X-ray/infrared images on the upper and lower right panels demonstrate that these mysterious sources are also detected at infrared wavelengths. This indicates that the galaxies around these supermassive black holes are heavily obscured by dust. Visible light is absorbed by the dust, which is heated by the absorption and glows at infrared wavelengths. Coordinates (J2000) RA 03h 32m 13.92s | Dec -27° 50' 00.7"